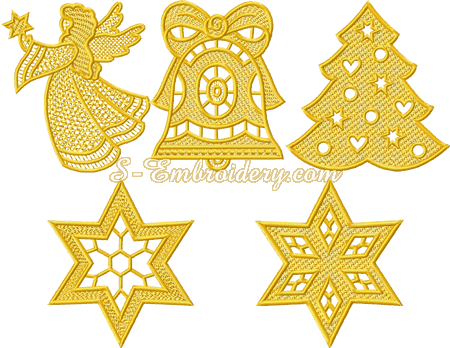 A set of 5 freestanding lace machine embroidery designs. These designs could be a fine supplement to your Christmas tree decoration or an interesting addition to your Christmas presents. Each design is available in 2 variants - one of them suitable for hanging the decoration on the Christmas tree. There is a small difference in size and stitch counts between these variants. 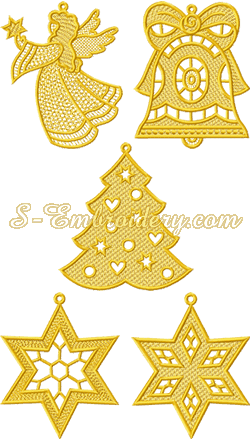 You receive 10 machine embroidery files and 1 PDF file with design information. Got these, very fast service, excellent designs, fansinating watching the work being sewn.